I remember myself more than twenty years ago discovering bands like Dio, Black Sabbath, Rainbow, Judas Priest or Iron Maiden. The moment I heard for the first time tunes like LA Connection, Long Live Rock’n’Roll, Heaven And Hell, Holy Diver all other things (music related) ceased to exist for me and I embarked on a journey that still goes on to this day. The true spirit of heavy metal unfolded before my very mind’s eyes, gripped me and shaped me into the person that I am nowadays. It is said that you never forget your first love: how true this is…after thousands of spins, these band’s albums still thrill me, still inspire me, still make me wonder at their marvelous simplicity, majesty or sheer unaltered undying power. With incredible gifted musicians like the second-to-none vocalists Ronnie James Dio, Rob Halford, or Bruce ‘The Air-Raid Siren’ Dickinson, axe-wielders gods Iommi, Blackmore, Tipton/Downing or Murray/Smith these bands walked the paths to glory and opened a new page in the History of Music. These were the times when the Titans roamed the Earth. Fast-forward…Anno Domini 2006, Band: Astral Doors, Album: Astralism. If this were a blind spin (no info on the band or year of release) I’d have said that Tony Martin had returned to the Black Sabbath ranks and issued the natural sequel to the glorious Tyr and Headless Cross. The music is deeply rooted in the eighties, with such crystal clear power riffs, majestic vocals, tight uncompromising rhythm section yet at the same time with a modern sound and taking full advantage of the production upgrading, getting the best of the two eras, managing to sound fresh and vintage at the same time. I couldn’t believe that in these days a band can release such a piece of clean uninfluenced top quality heavy metal. Having already released two albums, the 2003 debut Of The Son And The Father and the excellent sophomore 2005 Evil Is Forever, the only question regarding this third album was whether the Swedes were going to top the previous work or they will fail at it. Yet, they managed to outdo themselves and release another masterful piece of metal that will definitely become a strong contender for the heavy metal album of the year award. 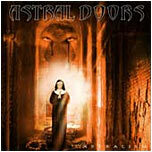 Astral Doors, together with fellow countrymen Wolf and Blaze are best examples that heavy metal is back in full force. Oh, and for the ones who might think that Astral Doors might be something like a tribute band or a copycat of the aforementioned names, let me put all your worries aside and say that Astral Doors is no more a copy of Black Sabbath than Dream Theater is a copy of Fates Warning or Virgin Steele a copy of Manowar. The fact that two bands can play top notch a certain genre doesn’t make one of them an imitator. Sure, Patrick Johansson’s voice has an uncanny resemblance to Tony Martin’s, deep and majestic, with powerful high range vocal lines coming from deep within, emotional and persuasive. The dual guitar attack by Martin Haglund and Joachim Nordlund is the main responsible for the musical phrasing of the whole album, both guitarists sharing the heavy crunchy riffs or the inspired solos. The keyboard player Joakim Roberg, his Hammond organ bringing an excellent touch to the music, complementing the powerful guitar led sound, does an excellent job. The rhythm section has Johan Lindstedt on bass and Mika Itaranta on drums, their joint effort laying the foundation for the heavy sound of the band. Fast paced energetic tracks like the excellent opener EVP with its crunchy riffs and excellent backing vocals, Fire In Our House with double guitar riffs beautifully supported by the organ leads and the great guitar solos or the organ loaded Vendetta with its combined guitar/organ solo swaps blend on the album with mid- or slow paced classic tunes like Black Rain that has some of the best vocal performances on the album, mid paced with good double guitar solo, or the highly addictive London Caves where we first get a glimpse of the beautiful organ in the music landscape. A classic Black Sabbath tune (Tyr-era), From Satan With Love has a huge guitar riff while the heavy and slow paced Israel with its historic/religious theme shares the same spirit with Dio’s powerful Egypt. The complex and strong composition Tears From A Titan has a slow start, then developing into a roller coaster of sound, with bursts of energetic drumming and riffing. Raiders Of The Ark and Oliver Twist are both mid-paced tracks with good organ hooks, excellent vocal harmonies, Patrick Johansson’s voice leading the attack while The Green Mile benefits from excellent dual riffs and guitar harmonies. In Rock We Trust is a statement in the vein of Dio’s We Rock or Judas Priest’s Rock Hard Ride Free while the closer Apocalypse Revealed is (aside from its uncharacteristic length – 7:40) the apex of the album, classic heavy metal with huge riffs, catchy hooks and solid drumming. This album shows once again how easy and simple is to create highest quality music. No need for flashy experiments, over-the-top performances, nothing like that. Strong musicianship, firm belief in your talent and a good production is all that it takes for a hand of true musicians to deliver one of the best heavy metal albums of the last years. Congratulations to Astral Doors for keeping up the heavy metal flame. The future is yours!